5607.11 A River Blackwater, Bradwell to Maldon. A new edition of Leisure Chart Folio SC5607. 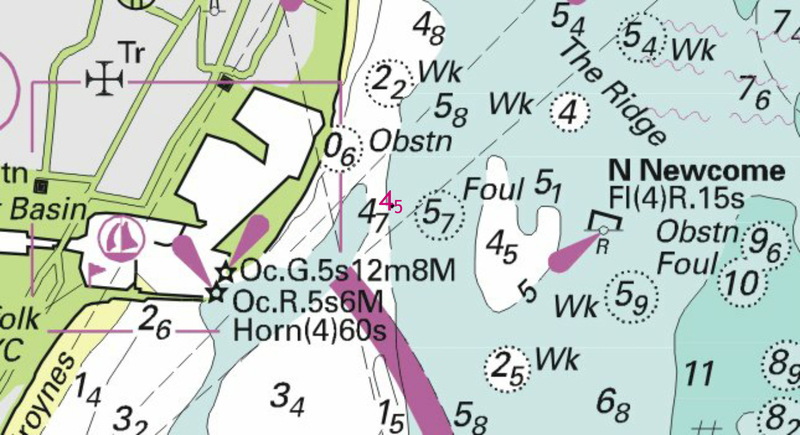 All sheets have been fully updated for New Editions and Notices to Mariners affecting source charts. depth, 1.1, enclosed by 2m contour at 52°35´·06N., 1°47´·00E. depth, 1.8, enclosed by 2m contour at 52°34´·85N., 1°47´·05E. Delete depth, 2.4, close S.
depth, 9.8, enclosed by 10m contour at 52°32´·82N., 1°48´·47E. Three additional reduced depths in the Holm Channel. The earlier NtM 4128 notified adjacent reduced depths so I have added the latest to the image to show a complete record. The three new soundings are indicated by arrows. depth, 3.3, and extend 5m contour NE to enclose 52° 41´·23N., 1° 45´·61E. Delete depth, 8.8, close SE. depth, 2.3, and extend 5m contour E to enclose 52° 41´·09N., 1° 45´·71E. Two new reduced depths on the east edge of the North Caister Shoal. The image shows those two positons. Note that there a dots marking previous NtM reduced depths which relate to NtMs 1364 and 2380(P) this year. A supplementary image shows those additional reductions. depth, 3.9, and extend 5m contour N to enclose 52° 29´·21N., 1° 47´·44E. Delete depth, 5.8, close SW.
UKHO Charts: 1535 and 1543. 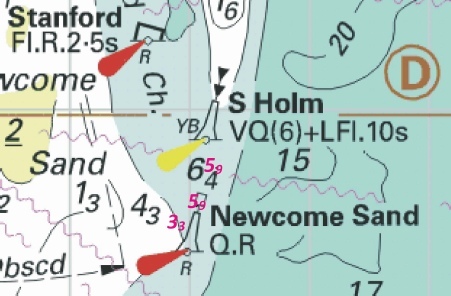 One reduction of depth on the Holm Sand off Lowestoft..
Q+LFl(6)(1)15s Bell South Corton with Q(6)+LFl.15s Bell South Corton at 52° 33´·24N., 1° 48´·47E. 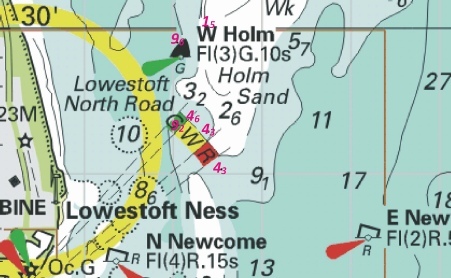 Fl.R.2·5s NE Holm with Fl.R.2·5s NE Holm at 52° 32´·80N., 1° 48´·54E. Note: Former Notice 5085(P)/18 is cancelled. the accompanying block, centred on: 52° 34´·6N., 1° 44´·3E. 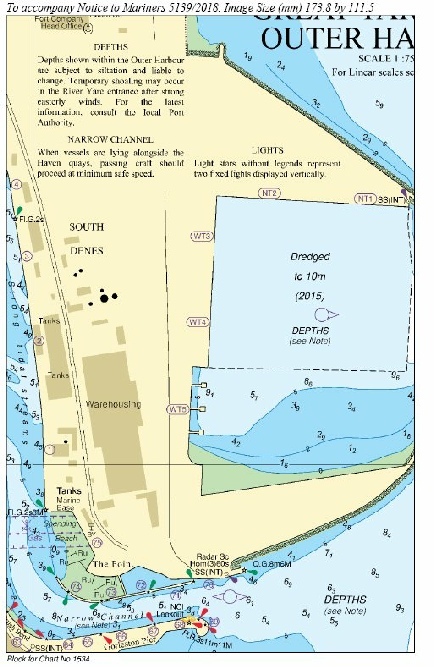 This replaces last week’s Preliminary NtM regarding the Great Yarmouth Outer Harbour depths. Note:Former Notice 4928(P)/18 is cancelled. depth, 5.2 at 52° 30´·98N., 1° 46´·81E. Delete depth, 7, close NE. depth, 5.3, and extend 10m contour W to enclose: 52° 30´·53N., 1° 46´·98E. depth, 9.7, and extend 10m contour NE to enclose: 52° 32´·46N., 1° 48´·75E. depth, 9.9, enclosed by 10m contour 52° 33´·46N., 1° 47´·34E. depth, 9.4, with depth, 9.1 at 52° 32´·60N., 1° 48´·49E. Delete legend, R, close N.
Mariners are advised to contact the local Port Authority for further information. Chart 1534 will have been updated by NM following New Edition publication on 11 October 2018. This preliminary Notice defines the whole area of the Outer Harbour at Great Yarmouth but does not indicate the revised depths. As this is an area leisure craft should not be, I have not included an image. 5·3m 52° 30´·53N., 1° 46´·98E. 5·2m 52° 30´·98N., 1° 46´·81E. 9·7m 52° 32´·46N., 1° 48´·75E. 9·1m 52° 32´·60N., 1° 48´·49E. 9·9m 52° 33´·46N., 1° 47´·34E. 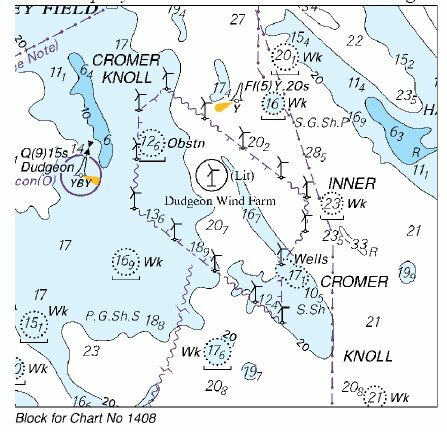 Charts 1534, 1535 and 1543 will be updated by Notice to Mariners following New Edition publication on 11 October 2018. 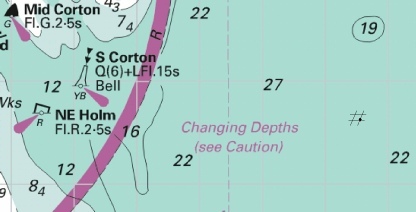 This year there have been several revisions of depths in and around the Holm Channel and Corton Road. This Preliminary Notices notifies five new reductions of depth. Even though the depths should not hinder leisure craft, the significance of the changes is worthwhile of note. Includes changes to depths from the latest British Government and Trinity House Surveys. ENGLAND - East Coast - Buoyage. Pilot boarding place. Q(6)+LFl.15s Bell S Corton, from: 52°32´·94N., 1°49´·12E. to: 52°33´·24N., 1°48´·47E. Q N Holm, from: 52°33´·93N., 1°47´·23E. to: 52°33´·73N., 1°47´·29E. 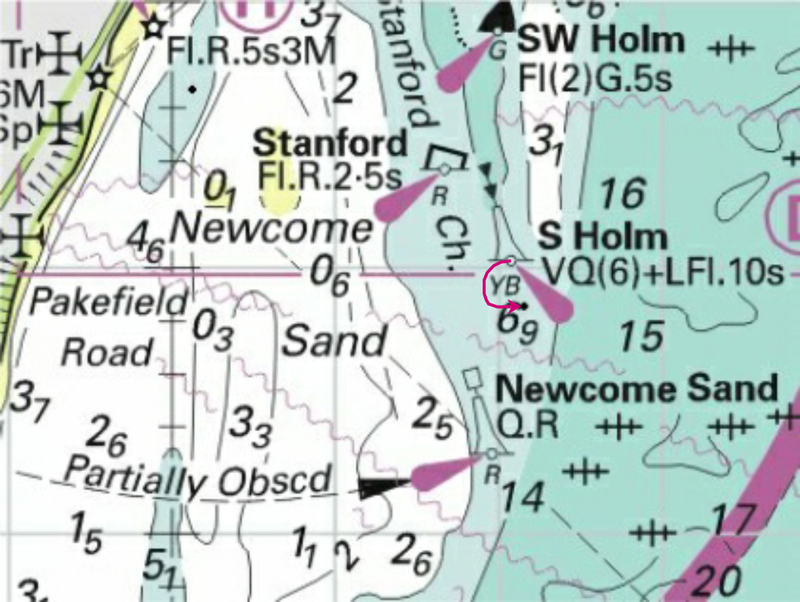 Q(9)15s Holm Sand, from: 52°33´·18N., 1°46´·55E. to: 52°33´·28N., 1°46´·62E. Fl.R.2·5s NE Holm, from: 52°32´·69N., 1°48´·49E. to: 52°32´·80N., 1°48´·54E. Lowestoft Inner, from: 52°29´·80N., 1°46´·97E. to: 52°29´·80N., 1°46´·70E. Fl(3)G.10s W Holm, from: 52°29´·80N., 1°47´·10E. to: 52°29´·50N., 1°46´·99E. Fl(4)G.15s NW Holm, from: 52°31´·93N., 1°46´·70E. to: 52°31´·47N., 1°46´·59E. Seven buoy moves for the Corton and Holm Sands in confirmation of Trinity House NtM No 15 of 2018 which I displayed in week 35..The image includes reduced soundings already reported vide NtoM Nos 272, 2380(P) and 4128. The one addition is a change of position of the Lowestoft Inner Pilot boarding place. the accompanying block, centred on: 52° 28´·6N., 1° 45´·5E. New block showing the new depths in the Hamilton Dock in Lowestoft. ENGLAND - East Coast - Wreck. Depth. at 52°°01´·66N., 1°30´·82E. Delete depth, 8.1, close E.
UKHO Charts: 2052 and 2693. This is pretty important. This is a new wreck just west off the bank of the Whiting and the symbol used means ‘Wreck over which the exact depth of water is unknown but is thought to be 28 metres or less, and which is considered dangerous to surface Navigation’. Note the sounding at the spot of the wreck is deleted. 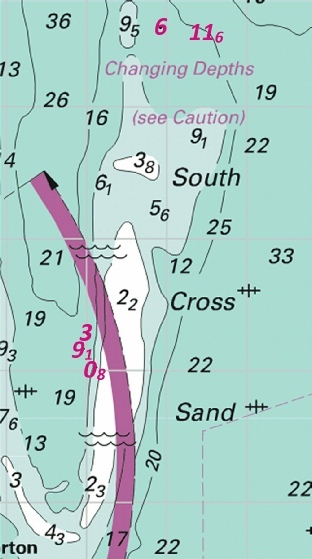 depth, 9.8, and extend 10m contour W to enclose at 52° 35´·05N., 1° 46´·93E. Delete depth, 12.9, close N.
depth, 8.3, and extend 10m contour W to enclose 52° 34´·74N., 1° 47´·04E. depth, 3.6, and extend 5m contour W to enclose 52° 34´·54N., 1° 47´·19E. Delete depth, 13.6, close W.
depth, 11.2 at 52° 33´·20N., 1° 48´·61E. Delete depth, 12, close S.
depth, 11.4 at 52° 32´·96N., 1° 48´·83E. Delete depth, 12.2, close N.
depth, 9.9, enclosed by 10m contour at 52° 32´·64N., 1° 48´·59E. depth 9.4, enclosed by 10m contour at 52° 32´·60N., 1° 48´·49E. Delete depth, 11, close NW. Eight reduced depths on the west side of the Corton Sand (which is encroaching). Note in partnership with the following Trinity House NtM. 1. Station: W. Holm Lighted Buoy. Moved to 52º 29.497’N., 001º 46.990’E. 2. Station: N. W. Holm Lighted Buoy. Moved to 52º 31.468’N., 001º 46.588’E. 3. Station: Holm Sand Lighted Buoy. Moved to 52º 33.283’N., 001º 46.621’E. 4. Station: N. Holm Lighted Buoy. Moved to 52º 33.730’N., 001º 47.289’E. 5. Station: N.E. Holm Lighted Buoy. 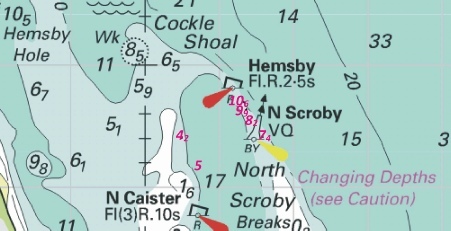 Moved to 52º 32.801’N., 001º 48.538’E. 6. Station: S. Corton Lighted buoy. 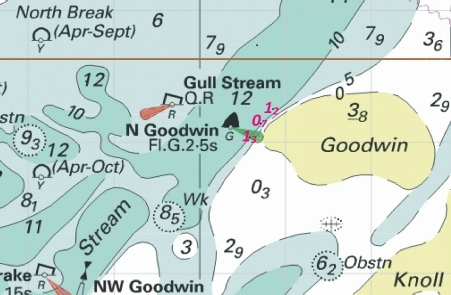 Moved to 52º 33.243’N., 001º 48.467’E. Movements effected consequent upon a recent survey. No further notice will be given. Trinity House No 15 of 2018 refers. 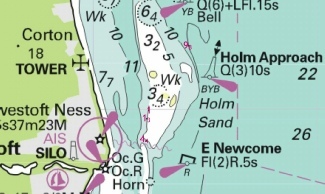 Movement of six buoys around the Holm Sand. The image includes reduced soundings already reported vide NtoM Nos 272, 2380(P) and 4128 (above). ENGLAND - East Coast - Lowestoft Harbour - Depths. depth, 2.5 at 52°28´·510N., 1°43´·154E. Delete depth, 2.8, close S.
depth, 3.3 at 52°28´·479N., 1°44´·071E. Delete depth, 3.8, close W.
depth, 3.2 at 52°28´·459N., 1°44´·168E. Delete depth, 3.6, close W.
depth, 2.4 at 52°28´·411N., 1°45´·054E. Delete depth, 3.1, close S.
depth, 1.7, enclosed by 2m contour 52°28´·405N., 1°45´·168E. depth, 1.8, enclosed by 2m contour at 52°28´·401N., 1°45´·221E. Delete depth, 2.7, close W.
depth, 2, enclosed by 2m contour at 2°28´·417N., 1°45´·332E. depth, 2.7, with depth, 2.4 at 52°28´·539N., 1°43´·517E. depth, 3, with depth, 2.7 at 52°28´·444N., 1°43´·989E. depth, 2.7, with depth, 2.3 at 52°28´·435N., 1°44´·051E. Delete alongside depth, 4·0m, close W.
depth, 2.4, with depth, 1.8, enclosed by 2m contour at 52°28´·425N., 1°44´·101E. 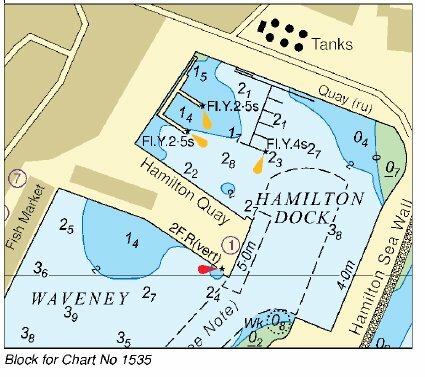 There are 12 reduced depths within either Lake Lothing (the outer marina), the Inner Harbour or the commercial part of the Outer Harbour such as the Trawl Dock. None of the reduced soundings affect the Marina Basin. I regret I am unable to illustrate those changes. 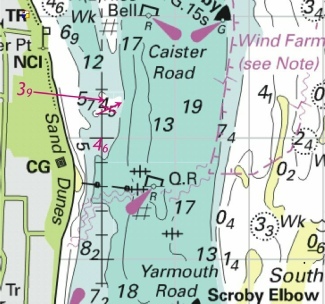 Chart 1504 - International Chart Series, England - East Coast, Cromer to Orford Ness. Includes new East Anglia One offshore windfarm and submarine cables and changes to Horne and Wren Gas Fields and depths from the latest British Government Surveys. ENGLAND - East Coast - Lowestoft Ness E - Buoy. The south cardinal buoy, Q(6)+LFl.15s Bell, in position 52° 28´·84N., 1° 46´·25E. , has been temporarily removed. In confirmation of the recent local NtM, the Outfall cardinal buoy is temporarily removed. ENGLAND - East Coast - Winterton Overfalls - Depths. depth, 9.8, enclosed by 10m contour at 52° 44´·50N., 1° 45´·85E. depth, 10.9 at 52° 44´·08N., 1° 45´·63E. Delete depth, 11.3, close W.
These two reduced soundings are shown on the first image of the next NtM (2380(P)) which are included in the Preliminary Notice below. ENGLAND - East Coast - Winterton Overfalls to Lowestoft - Depths. Drying heights. Wrecks. Obstruction. 9·8m 52° 44´·50N., 1° 45´·85E. 10·9m 52° 44´·08N., 1° 45´·63E. 4·9m 52° 41´·68N., 1° 45´·35E. 2·4m 52° 41´·35N., 1° 45´·42E. 1·8m 52° 40´·98N., 1° 45´·65E. 9·4m 52° 40´·52N., 1° 45´·64E. 9·2m 52° 39´·54N., 1° 48´·87E. 12·6m 52° 39´·60N., 1° 49´·14E. 13·6m 52° 39´·16N., 1° 49´·12E. 6·7m 52° 38´·20N., 1° 48´·93E. 14·9m 52° 37´·28N., 1° 52´·27E. 0·6m 52° 34´·71N., 1° 47´·15E. 10·5m 52° 33´·61N., 1° 47´·42E. 3·6m 52° 31´·48N., 1° 46´·92E. 4·7m 52° 31´·19N., 1° 48´·71E. 1·2m 52° 31´·11N., 1° 46´·87E. 0·6m 52° 30´·66N., 1° 47´·06E. 0·1m 52° 30´·33N., 1° 47´·32E. 3·7m 52° 29´·65N., 1° 47´·09E. 3·6m 52° 28´·55N., 1° 45´·94E. 4·7m 52° 28´·42N., 1° 45´·79E. 0m 52° 31´·15N., 1° 47´·18E. 0·2m 52° 30´·99N., 1° 47´·32E. 0·1m 52° 30´·17N., 1° 47´·52E. 14·4m 52° 40´·57N., 1° 45´·69E. 12·3m 52° 40´·77N., 1° 46´·37E. 15·1m 52° 37´·23N., 1° 46´·00E. 9m 52° 33´·07N., 1° 45´·80E. 2·5m 52° 28´·17N., 1° 46´·12E. 18·4 52° 37´·57N., 1° 45´·54E. These changes will be included in the next New Editions of Charts 1535, 1534, 1543 and 1504 to be published summer 2018. UKHO Charts: 1504, 1534, 1535 and 1543. Some many changes – 21 reduced depths, 3 drying, 5 wrecks and one obstruction. The images cover a number of earlier NtM which are all included in the three images. They refer to NtMs 272, 948, 809, 948, 1259 and 1364, all of 2018. ENGLAND - East Coast - Lowestoft SE - Obstructions. UKHO Charts: 1504, 1543, 1610 and 1630. Ten new obstructions identifying in and around the intended East Anglia One Wind Farm. 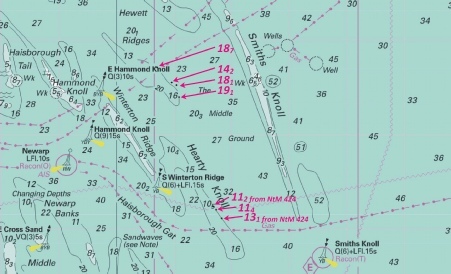 Buoyage for the Wind Farm was shown in NtM 301(P) in Week 3 (see there for the full details of the images) and has been included in the locations of the ten obstructions. All are deep and half are in the restricted area so this is not likely to hinder leisure craft. ENGLAND - East Coast - Cockle Shoal SE - Depths. depth, 9.7, and extend 10m contour E to enclose 52° 41´·81N., 1° 46´·20E. 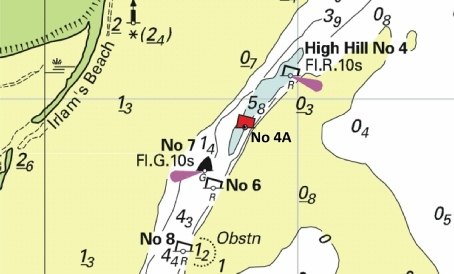 Delete depth, 10, close W.
depth, 7.9, and extend 10m contour E to enclose 52° 41´·17N., 1° 45´·68E. depth, 3.8, enclosed by 5m contour 52° 41´·12N., 1° 45´·65E. Delete depth, 8.3, close NW. depth, 3.3, and extend 5m contour E to enclose 52° 41´·03N., 1° 45´·68E. Delete depth, 4.1, close W.
UKHO Charts: 1534, and 1543. Four reduced depths to the east edge of the Cockle Shoal. ENGLAND - East Coast - Corton Sand - Depths. depth, 1.2, enclosed by 2m contour at 52° 34´·55N., 1° 48´·55E. Delete depth, 11.7, close SE. A dramatic change in depth in channel east of the Corton Sand. The image includes the lower two depth changes which had been reported in Week 7 vide NtM 809 of 2018. ENGLAND - East Coast - Great Yarmouth - River Yare - Lights. Fl.R.5s at 52° 35´·719N., 1° 43´·545E. Fl.G.4s at 52° 35´·526N., 1° 43´·618E. Fl.R.4s at 52° 35´·507N., 1° 43´·546E. Fl.G.3s at 52° 35´·207N., 1° 43´·786E. Fl.R.3s at 52° 34´·972N., 1° 43´·802E. Fl.R.2s at 52° 34´·801N., 1° 43´·881E. Fl.G.2s at 52° 34´·771N., 1° 43´·967E. This NtM was first notified by the local ABP NtM No 5 of 2018. Seven new shore side lights on the River Yare. ENGLAND - East Coast - South Cross Sand N - Depths. depth, 5.6 at 52°37´·4N., 1°51´·2E. Delete depth, 6, close NW. depth, 9.9, and extend 10m contour N to enclose 52°37´·83N., 1°51´·17E. depth, 7.2, and extend 10m approximate contour E to enclose 52°37´·44N., 1°51´·34E. UKHO Charts: 1408, 1504, 1534 and 1543. Three reductions of depth on the north tail of the South Cross Sand. ENGLAND - East Coast - South Cross Sand - Depths. 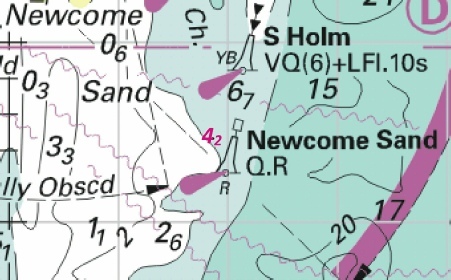 depth, 9.6, and extend 10m contour W to enclose 52° 34´·07N., 1° 48´·64E. depth, 3, enclosed by 5m contour 52° 33´·76N., 1° 49´·06E. Delete depth, 8.3, close NE. Two reductions of depth on the Corton Sand edge of the South Cross Sand. NORTH SEA - United Kingdom Sector - Cromer Knoll SE - NM Blocks. Note. the accompanying block, centred on: 53° 15´·8N., 1° 23´·2E. note, WIND FARM UNDER CONSTRUCTION, centred on: 52° 12´·7N., 5° 07´·1E. UKHO Charts: 1408 and 1503. Two blocks for UKHO charts now showing the Dudgeon Wind Farm. Note: This chart remains affected by Notice 3496(P)/17. This Preliminary Notice was notified in week 31 of last year and the notice and image can be seen on this page in the 2017 list. ENGLAND - East Coast - Middle Cross Sand - Depths. depth, 3.8, enclosed by 5m contour at 52° 39´·86N., 1° 53´·06E. Two reduced depths on the eastern edge of the Middle Cross Sand off shore off Caister. ENGLAND - East Coast - Approaches to Lowestoft and Holm Sand - Depths. Drying height. Note: This update is included in New Edition 1543, published 1 February 2018.
depth, 0.8, enclosed by 2m contour at 52° 31´·32N., 1° 46´·96E. depth, 3.5, enclosed by 5m contour at 52° 31´·14N., 1° 48´·57E. drying height, 0.1, enclosed by 0m low water line at 52° 31´·15N., 1° 47´·00E. depth, 4.6 at 52° 28´·555N., 1° 45´·944E. Delete depth, 3.4, close SE. depth 4.7, at 52° 28´·480N., 1° 45´·857E. Delete depth, 4.3 , close W.
depth, 2.9 at 52° 28´·20N., 1° 45´·57E. depth, 4.5 at 52° 28´·510N., 1° 45´·883E. UKHO Charts: 1534, and 1535. Three reduced depths around the Holm Sands north of Lowestoft. Two of those are to the west edge of the Holm Sand are encroaching into the Corton Road. Note that the edge of the Sand is very steep. Note also last year’s NtM No 4038 of Week 35 showed a quite different depth adjacent. There are also four reduced depths in the Lowestoft Approaches but these are not so critical. ENGLAND - East Coast - Blakeney Point E - Legend. legend, Planned, centred on: 52° 58´·08N., 1° 08´·85E. UKHO Leisure Folios: 5614.7, 5606.3. 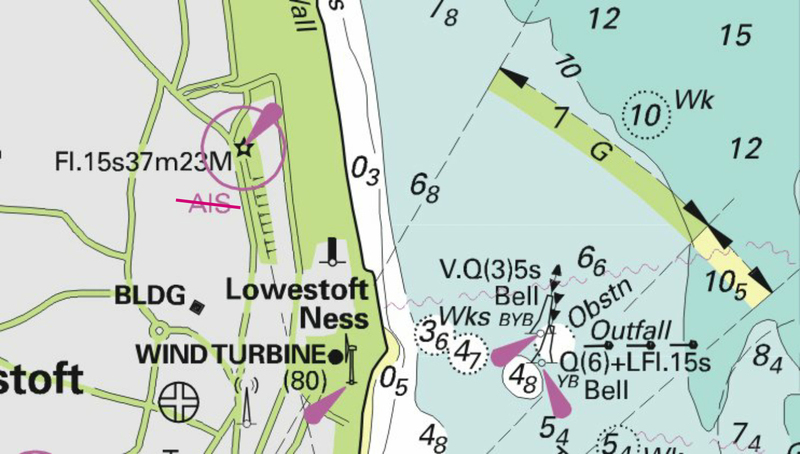 The ‘Legend’ referenced in the NtM is not shown on Leisure Charts so I cannot illustrate it or explain the deletion other than to suggest that this may have been to do with the cabling to the Sheringham Shoal Wind Farm which is adjacent to the Lat/Long reference. 301(P)/2018 ENGLAND - East Coast - Lowestoft SE - Works. Maritime limit. Buoyage. North Cardinal NNW EA1 VQ at 52° 19´·49N., 2° 29´·58E. North Cardinal NORTH EA1 Q at 52° 19´·97N., 2° 33´·52E. East Cardinal NNE EA1 Q(3)10s at 52° 18´·55N., 2° 34´·59E. Special EA1 ALPHA Fl.Y.5s at 52° 16´·66N., 2° 34´·37E. East Cardinal EAST EA1 VQ(3)5s at 52° 14´·20N., 2° 34´·09E. Special EA1 BRAVO Fl.Y.5s at 52° 12´·03N., 2° 33´·84E. East Cardinal SSE EA1 Q(3)10s at 52° 09´·85N., 2° 33´·54E. South Cardinal SOUTH EA1 Q(6)+LFl.15s at 52° 08´·63N., 2° 31´·68E. West Cardinal SSW EA1 Q(9)15s at 52° 09´·09N., 2° 27´·36E. Special EA1 CHARLIE Fl.Y.5s at 52° 10´·93N., 2° 26´·37E. West Cardinal WEST EA1 VQ(9)10s at 52° 12´·75N., 2° 25´·34E. Special EA1 DELTA Fl.Y.5s at 52° 14´·87N., 2° 26´·09E. West Cardinal WNW EA1 Q(9)15s at 52° 16´·99N., 2° 26´·89E. All vessels should navigate with caution in the area. A safety zone of 500m becomes operational around the turbines under construction. These changes will be included in a New Edition of Chart 1504 to be published early 2018. UKHO Charts: 1406, 1408, 1504, 1630, 1631 and 2182A. 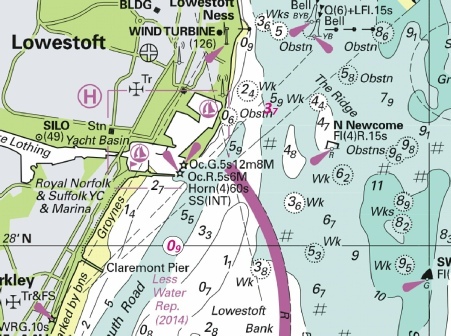 A collection of new buoyage to surround the construction area of the East Anglia 1 Wind Farm. Two images provided, the first to show the context of the position just west of the North Hinder junction and well east of Lowestoft and Southwold, the second to show the detail. Note the exclusion safety zone once construction starts. ENGLAND - East Coast - Stanford Channel - Depths. Foul. Buoy. 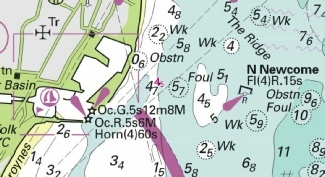 depth, 5, and extend 5m contour W to enclose 52° 27´·46N., 1° 47´·07E. Delete depth, 5.9, close E.
depth, 5, and extend 5m contour S to enclose 52° 26´·87N., 1° 47´·27E. depth, 6.3 at 52° 26´·85N., 1° 47´·01E. depth, 4.5, and extend 5m contour E to enclose 52° 26´·43N., 1° 47´·01E. depth, 4.6, and extend 5m contour NE to enclose 52° 26´·33N., 1° 47´·09E. Delete depth, 4.6, close SW and depth, 6.4, close E.
depth, 3.8 at 52° 26´·32N., 1° 46´·96E. (7.2) with (6.7) at 52° 27´·64N., 1° 46´·44E. Q.R Newcome Sand, from: 52° 26´·28N., 1° 46´·99E. to: 52° 26´·33N., 1° 47´·16E. 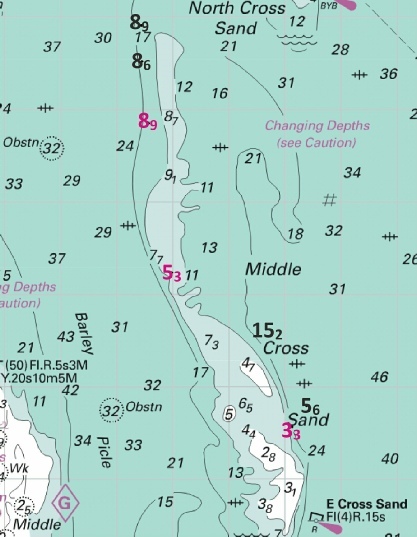 A collection of 7 reduced depths in the Stanford Channel with a group around the Newcome Sand PHM buoy (which is also slightly moved. But not critical to leisure craft. ENGLAND - East Coast - Lowestoft SE - Wreck. Buoyage. Radar beacon. at 52° 25´·2N., 1° 49´·8E. symbol, blue and yellow emergency wreck marking buoy, Al.Oc.BuY.3s, and associated radar beacon, Racon(D) at 52° 25´·50N., 1° 49´·67E. 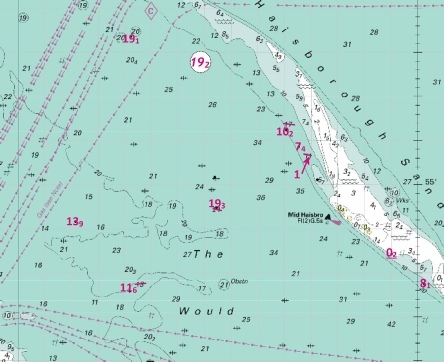 The wreck ‘Ella’ has been removed and the wreck buoys marking the hazard has been deleted. The original notification was in Week 38 vide NtM 4392. ENGLAND - East Coast - Holm Sand - Depths. One slight reduced of depth just south of the NE Holm PHB. Not likely to hinder leisure craft (an earlier NtM just north of the NE Holm buoy is also shown – this was NtM 4332/2017 week 37). ENGLAND - East Coast - Winterton-on-Sea to Great Yarmouth - Depths. Obstructions. depth, 5.7 at 52° 36´·85N., 1° 44´·93E. depth, 9.3, enclosed by 10m contour 52° 32´·88N., 1° 45´·86E. depth, 9.6, and extend 10m contour E to enclose 52° 32´·68N., 1° 45´·80E. depth, 9.9, enclosed by 10m contour at 52° 32´·68N., 1° 46´·00E. Delete depth, 10.9, close N or W or depth, 10.2, close S dependent on chart. depth, 4.9, with depth, 4.1 at 52° 46´·97N., 1° 37´·83E. depth, 13.2, with depth, 9.8, and extend 10m contour W to enclose 52° 40´·13N., 1° 44´·39E. Obstn with Obstn at 52° 35´·40N., 1° 44´·58E. Twelve new reductions of depth between Winterton-on-sea and Great Yarmouth in the in-shore channels. The changes are illustrated in three images. ENGLAND - East Coast - Middle Cross Sand - Depth. depth, 8.5, and extend 10m contour NE to enclose 52° 40´·15N., 1° 53´·40E. A single new reduction of depth to the eastern side of the Middle Cross Sand (off Caister). ENGLAND - East Coast - Orford Ness - Depths. Wrecks. depth, 19.9, enclosed by 20m contour 52° 16´·27N., 1° 56´·50E. Delete depth, 20.4, close SE. Wk at 52° 11´·42N., 1° 39´·50E. depth, 9.7, and extend 10m contour NE to enclose 52° 08´·79N., 1° 38´·54E. Delete depth, 13.2, close N.
depth, 6.9 at 52° 08´·37N., 1° 37´·97E. Delete depth, 9.8, close E and depth, 9.5, close SW.
depth, 1, and extend 2m contour S to enclose 52° 07´·48N., 1° 37´·30E. Delete depth, 1.6, close NW. depth, 13.4, enclosed by 15m contour 52° 03´·96N., 1° 42´·62E. Delete depth, 16.4, close W.
Wk with Wk at 52° 17´·61N., 1° 47´·14E. with Wk at 52° 05´·46N., 1° 38´·97E. 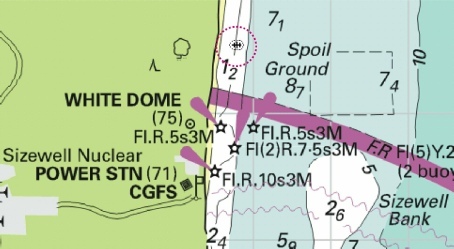 Eleven reduced depths or wrecks around the Orford Ness. This area has also been subject to other reduction and new wreck depths in the area for NtM 400, 469, 1880, 1886 and 3532 and so I have combined all the changes for all of these NtM in the two images. Port Authority and Trinity House surveys. ENGLAND - East Coast - Lowestoft NE, E and SE - Depths. Wreck. depth, 17.7, and extend 20m contour SE to enclose 52° 34´·27N., 1° 57´·12E. depth, 14 at 52° 28´·89N., 1° 49´·29E. Delete depth, 16.6 , close NW and 23.5, close NE according to chart. at 52° 27´·01N., 1° 49´·55E. depth, 15.8 at 52° 28´·25N., 1° 49´·30E. depth, 15.5, and extend 20m contour SE to enclose 52° 26´·02N., 1° 49´·08E. depth, 14.8, enclosed by 15m contour 52° 24´·42N., 1° 48´·59E. depth, 17.4, and extend 20m contour E to enclose 52° 24´·63N., 1° 49´·81E. depth, 18, and extend 20m contour E to enclose 52° 24´·67N., 1° 51´·63E. Delete depth, depth, 21, close NE. depth, 20.4 at 52° 22´·16N., 1° 53´·77E. Delete depth, 23.5, close E.
ENGLAND - East Coast - Approaches to Lowestoft - Radar beacon. radar beacon, Racon(D), at light-buoy 52° 25´·31N., 1° 49´·67E. Racon(D) now added to the furthest north wreck buoy marking the positon of the old tug ‘Ella’. The wreck buoys were reported in NtM 3839 in week 34. 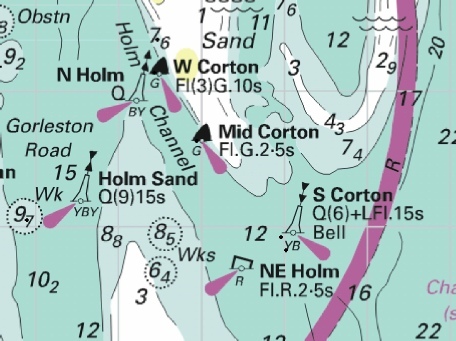 ENGLAND - East Coast - Holm Channel and Corton Sand W - Depths. 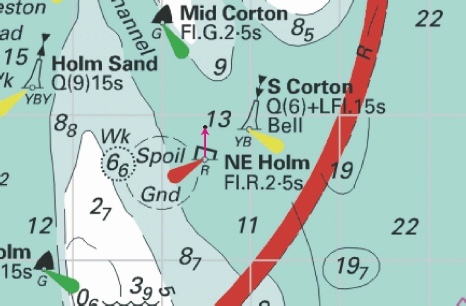 Two reduced depths in the Holm Channel. The Scroby Sands encroaching to the west (i.e. the eastern side of the Holm Channel). ENGLAND - East Coast - Corton Road - Depths. depth, 7.2, enclosed by 10m contour at 52°31´·48N., 1°46´·89E. depth, 6.8, enclosed by 10m contour at 52°30´·70N., 1°47´·01E. depth, 10.1 at 52°30´·86N., 1°46´·95E. Three reduced of depths in the Corton Road between the West Holm and the North West Holm buoys. Reduced depths but still unlikely to hinder leisure craft. ENGLAND - East Coast - Approaches to Lowestoft - Wreck. Buoyage. depth, 13, with at 52° 25´·2N., 1° 49´·7E. Wk (buoyed) at 52° 25´·23N., 1° 49´·67E. ENGLAND - East Coast - Southwold SE - Wrecks. with at 52° 13´·39N., 1° 46´·62E. with at 52° 18´·51N., 1° 46´·82E. with at 52° 19´·76N., 1° 47´·58E. 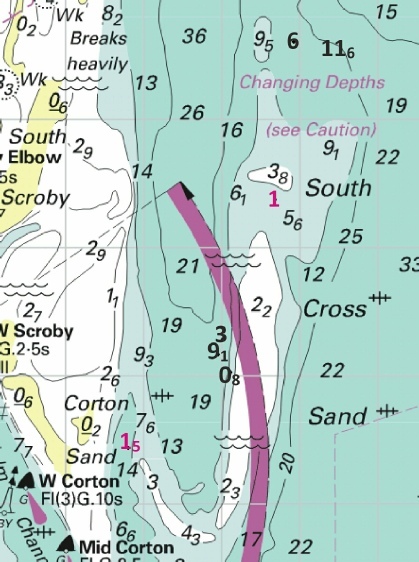 Redefined depths swept over three wrecks off Southwold and the Dunwich Bank. ENGLAND - East Coast - Stanford Channel - Legend. legend, Less water (2016), orientated S/N, centred on: 52°28´·17N., 1°47´·44E. on Chart 1535 or centred on: 52°28´·27N., 1°47´·47E. on Chart 1543. New depths had already been reported vide NtM 2534 in Week 22. Now the additional ‘banner’ ‘Less Water) is added as shown on the image below. ENGLAND - East Coast - Blakeney Hr. - Buoy. ENGLAND - East Coast - Lake Lothing - Wreck. Fl.Y.3s at 52° 28´·603N., 1° 43´·228E. New lit wreck on the north side of Lake Lothing. ENGLAND - East Coast - Caister Shoal NE and Stanford Channel - Depths. depth, 10, enclosed by 10m contour at 52°41´·93N., 1°46´·04E. depth, 8.6, and extend 10m contour SE to enclose 52°41´·69N., 1°46´·34E. Delete depth, 9.1 , close NW. depth, 2.9, and extend 5m contour E to enclose 52°41´·23N., 1°45´·44E. Delete depth, 5.9 , close W.
depth, 4.1, enclosed by 5m contour at 52°41´·04N., 1°45´·63E. Delete depth, 12, close NE. depth, 1, enclosed by 2m contour at 52°28´·48N., 1°47´·50E. depth, 0.9, and extend 2m contour E to enclose 52°28´·24N., 1°47´·45E. Delete depth, 1.2, close NW. depth, 0.9 at 52°28´·06N., 1°47´·40E. depth, 1.6, enclosed by 2m contour at 52°27´·57N., 1°47´·33E. Delete depth, 2.4, close N.
depth, 6.4 at 52°26´·32N., 1°47´·15E. Delete depth, 8.9 , close SE. 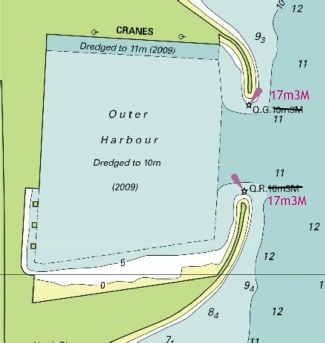 4 reduction of depth near the Caster Shoal. The image below also include the NtM No 1135 (Week 10) with two reductions under 2m. And, 5 reductions of depth in the Stanford Channel off Lowestoft. ENGLAND - East Coast - Kessingland S - Wrecks. Wk at 52° 22´·71N., 1° 43´·40E. Wk at 52° 23´·21N., 1° 44´·42E. 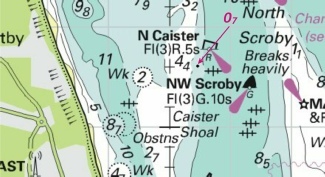 Two new wrecks just south of the Benacre Ness. Both quite in-shore but at 6.6 and 9.4 metres will not hinder leisure craft. ENGLAND - East Coast - Lowestoft - Buoy. Compass at 52° 28´·549N., 1° 43´·583E. ENGLAND - East Coast - Approaches to Lowestoft - Wrecks. Depths. Wk at 52° 32´·67N., 1° 59´·42E. Wk at 52° 28´·37N., 1° 53´·50E. Delete depth, 24, close SW and depth, 25.5, close E.
Wk at 52° 25´·74N., 1° 48´·21E. Wk at 52° 21´·81N., 1° 55´·47E. Four new wrecks off Lowestoft. All at are least 18.2m so will not hinder leisure craft. ENGLAND - East Coast - Lowestoft - NM Block. Light. light to, DirWRG.17m10M at 52° 27´·71N., 1° 44´·54E. the accompanying block, centred on: 52° 28´·0N., 1° 47´·5E. Revision on the light characteristics on the light off Kirkley, south of Lowestoft. A UKHO chart block is available from the download button in the column to the left. ENGLAND - East Coast - Sizewell Bank - Buoyage. Lights. Two light types and light characteristics changed off the Sizewell Power Station. ENGLAND - East Coast - Orford Ness NE - Depths. depth, 1.4, enclosed by 2m contour at 52° 05´·72N., 1° 35´·84E. Delete depth, 4.6, close NE and depth, 12.8, close SE. Two reduced depths at either end of the Aldeburgh Ridge. ENGLAND - East Coast - Sizewell Bank to Aldeburgh Ridge - Wrecks. Depths. Wk at 52° 06´·10N., 1° 38´·01E. Wk at 52° 09´·54N., 1° 38´·57E. Wk at 52° 13´·07N., 1° 39´·96E. UKHO Charts: 1504, 1543, 1610 and 2052 Note: This update is included in New Editions 1406 and 1408, published 27 April 2017. 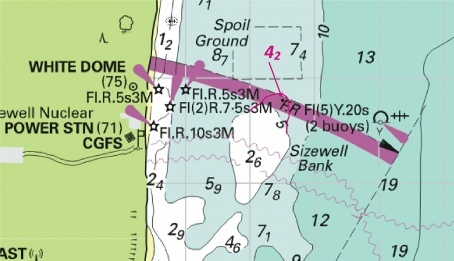 Six new wrecks around Aldeburgh and Sizewell. All sufficiently deep enough not to hinder leisure craft. ENGLAND - East Coast - Approaches to Lowestoft - Depths. depth, 1.8, enclosed by 2m contour 52° 41´·04N., 1° 45´·45E. depth, 3.2, enclosed by 5m contour 52° 29´·58N., 1° 47´·14E. Two pairs of depth reductions off Great Yarmouth and Lowestoft. 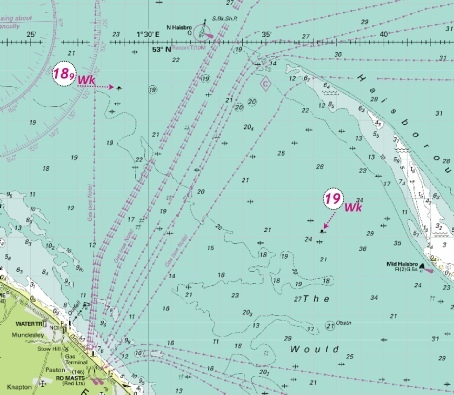 First, two reductions off the east side of the north of the Caister Shoal. Secondly, two reductions off Lowestoft. First, in the Lowestoft North Road, then in the Lowestoft South Road. ENGLAND - East Coast - Dunwich Bank E - Wreck. Insert Wk at 52° 16´·28N., 1° 57´·54E. 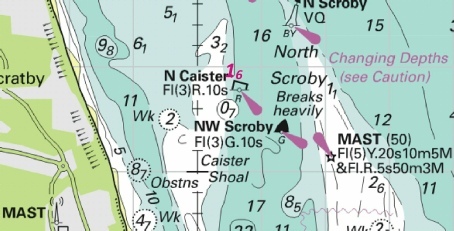 A new wreck approximately 12nm east of Southwold. But at 25m should not hinder leisure craft. ENGLAND - East Coast - Aldeburgh Napes - Wreck. Wk at 52° 08´·19N., 1° 41´·44E. A new wreck off Aldeburgh but at 14.1m unlikely to hinder leisure craft. 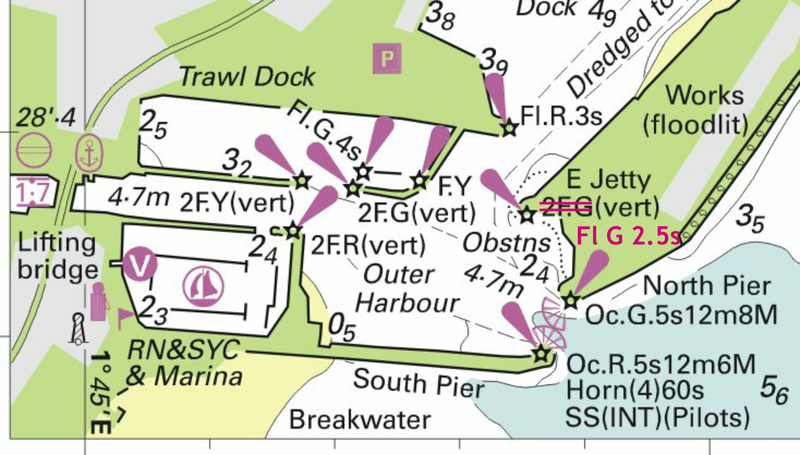 Includes changes to depths from the latest British Government, Port Authority and Trinity House surveys. England - East Coast, Orford Ness to Whitby. This is confirmation of the local NtM from the Port of Great Yarmouth. Only the first new light is located on this part of the image (remainder further north alongside the River Yare) so I have added the local NtM as it includes a location description. 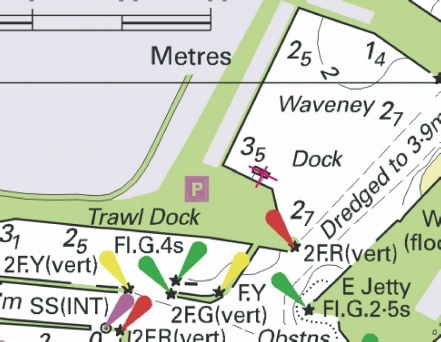 Mariners are advised that seven new Aids to Navigation have been established on the River Yare, South of the Haven Bridge. The aids consist of solar powered navigation lights mounted on 1.8 metre high galvanised steel columns. The table below gives details of these lights and their locations. SW CORNER BERTH 1A 52° 34.450’ N 001°44.023’ E Fl. G 2s 3 N.M. BERTH 6/7 52° 35.069’ N 001° 43.827’ E Fl. G 3s 3 N.M.
WHARF 52° 35.195’ N 001° 43.713’ E Fl. R 3s 3 N.M. BERTH 10/11 52° 35.330’ N 001° 43.760’ E Fl. G 4s 3 N.M.
SOUTH BERTH 32D 52° 35.376’ N 001° 43.657’ E Fl. R 4s 3 N.M.
NORTH BERTH 14 52° 35.717’ N 001° 43.618’ E Fl. G 5s 3 N.M.
ENGLAND - East Coast - Approaches to Great Yarmouth - Holm Channel - Buoyage. Q(6)+LFl.15s S Corton Bell, from: 52°32´·1N., 1°50´·0E. to: 52°32´·9N., 1°49´·0E. Fl.G.2·5s Mid Corton, from: 52°33´·62N., 1°48´·01E. to: 52°33´·61N., 1°47´·98E. This was first notified in Trinity House NtM No 12 of 2016 in week 28. This is UKHO confirmation in respect of their charts. Note that the movement is too slight to draw on the image. NORTH SEA - United Kingdom Sector - North Hinder North TSS NW - Fouls. at 52° 17´·99N., 2° 28´·70E. Four new Fouls well offshore off Suffolk. All over 30m of depth so unlikely to hinder leisure craft. Date : On or about 15th July, 2016. 1. Station : S. Corton Lighted Buoy. Amendment : To be moved to Latitude 52º 32.898’N., Longitude 001º 48.992’E. 2. Station : Mid Corton Lighted Buoy. Amendment : To be moved to Latitude 52º 33.609’N., Longitude 001º 47.977’E. 3. Station : W. Corton Lighted Buoy. Amendment : To be moved to Latitude 52º 34.111’N., Longitude 001º 47.467’E. Movements to be effected consequent upon a recent survey. Trinity House is advising of very slight movement of three ‘Corton’ buoys. Movement is too small to illustrate. ENGLAND - East Coast - Approaches to Lowestoft - Light. Mariners are informed that all ENCs of the area are showing the correct depiction. These changes will be included in a New Edition of Chart 1535 to be published in late 2016 to also include new survey information. Charts 1543 and 1504 will be updated by NM on publication of the new edition. UKHO Charts: 1504, 1535 and 1543. Already notified by ABP Lowestoft. This widens the multi light sequence slightly. ENGLAND - East Coast - Approaches to Great Yarmouth - Gorleston Road - Depths. depth, 3.4, enclosed by 5m contour at 52° 34´·564N., 1° 44´·576E. depth, 9.5, enclosed by 10m contour at 52° 34´·15N., 1° 45´·60E. Delete depth, 10.1, close NW. depth, 8.1 at 52° 33´·92N., 1° 45´·41E. Delete depth, 9.7, close SE. depth, 5.1 at 52° 33´·54N., 1° 44´·61E. Delete depth, 6.3, close S.
depth, 7.8 at 52° 33´·29N., 1° 45´·26E. Six reduction of depths in the outer harbour of Great Yarmouth and the Gorleston Road approaches. None of these reductions are likely to hinder leisure craft. ENGLAND - East Coast - Approaches to Great Yarmouth - Middle Cross Sand - Depths. depth, 5.5 at 52° 39´·87N., 1° 53´·35E. depth, 8.5, enclosed by 10m contour at 52° 39´·97N., 1° 53´·47E. depth, 14.5, enclosed by 15m contour at 52° 40´·01N., 1° 53´·55E. Three reduced depths showing the Middle Cross Sand is migrating towards the east. 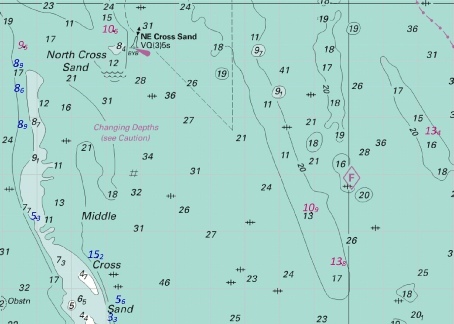 This notice is associated with the two buoyage changes NtM 2587 of week 20; this shows the move to the north of the East Cross Sand and the placing of a new south cardinal buoy making the bottom of the Middle Cross Sand. The image compiles both NtM in one. ENGLAND - East Coast - Approaches to Lowestoft - Buoy. Insert Fl(5)Y.20s at 52°28´·55N., 1°49´·03E. Insertion of the yellow special lit buoy just to the west and very adjacent to the East Newcombe port hand buoy. ENGLAND - East Coast - Approaches to Lowestoft and Great Yarmouth - Depths. depth, 14.7 , and extend 15m contour E to enclose 52° 32´·80N., 1° 49´·05E. Delete depth, 16.4 , close SE. depth, 4.8 , and extend 5m contour W to enclose 52° 29´·36N., 1° 47´·39E. Delete depth, 7.3 , close SE. depth, 4.6 , and extend 5m contour S to enclose 52° 29´·05N., 1° 47´·33E. Delete depth, 6.1 , close S.
depth, 3.5 , and extend 5m contour SE to enclose 52° 28´·48N., 1° 45´·97E. Delete depth, 4 and 5.6, close NW. depth, 8, with depth, 0.5 , and extend 2m contour W to enclose 52° 34´·35N., 1° 47´·51E. with , drying height 0.5 at 52° 28´·519N., 1° 45´·668E. 6 reduced depths in the approaches to Lowestoft. Note notice 218 of week 2 of this year had other reduced depths in the area. ENGLAND - East Coast - Approaches to Lowestoft and Great Yarmouth - Buoyage. Q(6)+LFl.15s Barley at 52° 38´·1N., 1° 52´·9E. 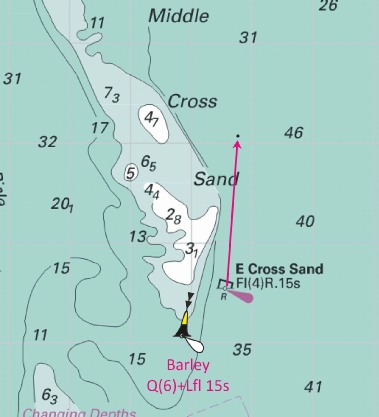 Fl(4)R.15s E Cross Sand, from: 52° 37´·9N., 1° 53´·3E. to: 52° 40´·1N., 1° 53´·8E. 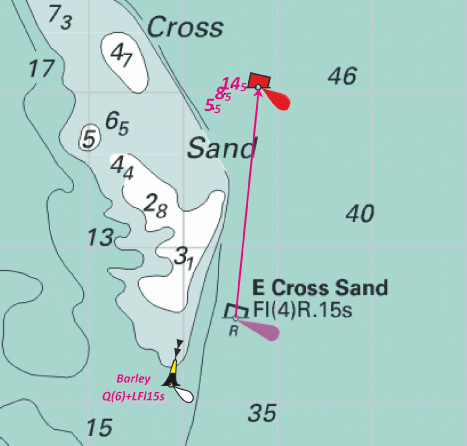 UKHO confirmation of the Trinity House notification in week 16 inserting the new ‘Barley’ south cardinal buoy at the south of the Middle Cross Sand and move of the East Cross Sand port hand buoy to the north. ENGLAND - East Coast - Great Yarmouth - River Yare - Lights. Pontoon. at 52° 35´·259N., 1° 43´·774E. Date : On or about 4th April, 2016. 1. Station: E. Cross Sand Lighted Buoy. Amendment: To be moved to Latitude 52° 40.050’N., Longitude 001° 53.800’E. 2. New Station: Barley Lighted Buoy. Position: Latitude 52° 38.050’N., Longitude 001° 52.900’E. Characteristics: Pillar: Yellow above Black: Q(6) + L.Fl.15 seconds: South Cardinal Topmark. Alterations to be effected consequent upon a recent survey. Amendment to Notice - E. Cross Sand and Barley Lighted Buoys will now be actioned on or about 17th April, 2016. 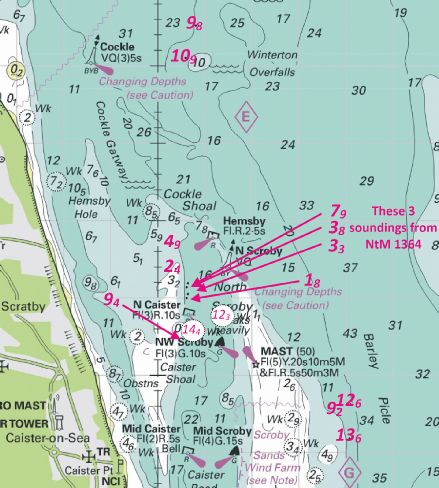 Chart 106 - England - East Coast, Cromer to Smiths Knoll. Includes changes to depths from the latest British Government and commercial surveys. ENGLAND - East Coast - Approaches to Great Yarmouth - North Scroby N - Depths. depth, 8.8, and extend 10m contour N to enclose 52° 41´·72N., 1° 46´·30E. Delete depth, 9.2, close S.
Small reduction of depth on the North Scroby Sands adjacent to the Hemsby port hand buoy. depth, 3.7, and extend 5m contour E to enclose 52° 28´·542N., 1° 45´·957E. Three new reduced depths in different channels. The third depth affects the Lowestoft South Road and a serious reduced of good water to 0.9m. depth, 4, and extend 5m contour E to enclose 52° 28´·510N., 1° 45´·950E. maintained depth, 3·7m, centred on: 52° 28´·390N., 1° 44´·699E. Delete depth, 4, close S.
This is UKHO confirmation of the Port of Lowestoft warning of reduction depth on the approach. (This also repeated the 3.4m depth previously warned in Port of Lowestoft No 6 of 2015). The maintained depth of 3.7m refers to adjacent the Yacht Basin. 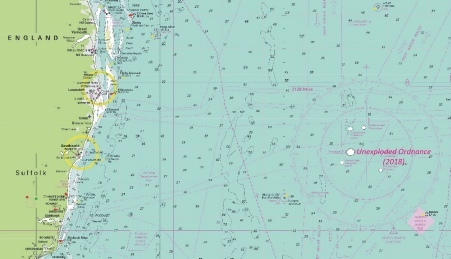 ENGLAND - East Coast - Approaches to Yarmouth - Caister Shoal NE - Depth. depth, 1.6m, enclosed by 2m contour 52° 40´·89N., 1° 45´·57E. New reduction of depth just north of the North Caister port hand buoy. ENGLAND - East Coast - Newarp Banks - Depths. Note: This update is included in New Edition 1543, published 8th October 2015.
depth, 8.8, enclosed by 10m contour at 52° 44´·04N., 1° 57´·65E. depth, 9.1, with depth, 8.7 at 52° 43´·4N., 1° 58´·0E. Image courtesy of Imray Chart C28 and Meridian ID10. Reduction of depths just to the east of the NE Cross Sand of the Newarps Banks. The reduction of depth at 5.3m is a repeat from NtM 797 of 2015 and can be copied from Week 7 if you want it recopied. ENGLAND - East Coast - Approaches to Great Yarmouth - Foul. at 52° 32´·60N., 1° 53´·60E. 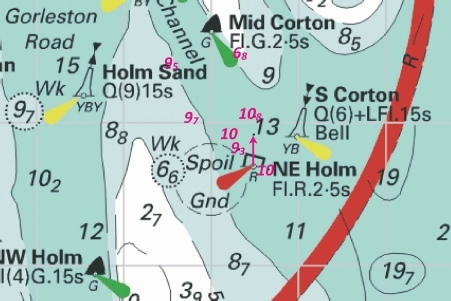 This new Foul is at a depth that should not trouble leisure craft and is situated east of the approach to the Holm Channel. 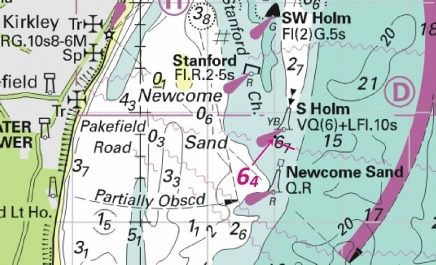 ENGLAND - East Coast - Stanford Channel - Depths. depth, 6.7, with depth, 6.4 at 52° 26´·75N., 1° 47´·04E. Small reduction in depth adjacent to the South Holm south cardinal buoy. Includes changes to depths from the latest British Government, Commercial and Trinity House surveys. ENGLAND - East Coast - Lowestoft Harbour - NM Block. Depths. The accompanying block, centred on: 52° 28´·385N., 1° 44´·725E. 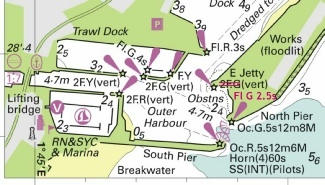 The UKHO has issued a replacement block for their chart 1535 for part of the inner harbour area. The revised depth is within Lake Lothing. ENGLAND - East Coast - The Would - Depths. Wreck. depth, 11.6 at 52°52´·56N., 1°34´·22E. Delete depth, 13.1, close N.
depth, 8.1, and extend 10m contour SW to enclose 52°52´·72N., 1°45´·28E. Delete depth, 12.6, close NW. depth, 19.3, enclosed by 20m contour at 52°54´·46N., 1°37´·49E. Delete depth, 20.6, close S.
depth, 10.2, and extend 15m contour SW to enclose 52°56´·23N., 1°40´·09E. Delete depth, 17.1, close N.
depth, 19.1, and extend 20m contour SW to enclose 52°58´·34N., 1°34´·26E. Delete depth, 19.6, close NE. ENGLAND - East Coast - Walton Backwaters - Hamford Water - Buoy. No 4A at 51°53´·930N., 1°15´·790E. UKHO confirmation of the notice published by Harwich Haven a few weeks ago. A new buoy (4a) on the approaches to Hamford Water. ENGLAND - East Coast - Winterton Ridge S - Depth. depth, 13.4 at 52°42´·7N., 2°02´·5E. Delete depth, 15.3 , close NW. This is a repeat of one new depth that was reported vide NtM 1400 back in week 12. This appears to have been repeated to deal with changes to chart 1408 which was not included in the previous notice. The image is a repeat of the five reductions of depth on the Newarp Banks listed in Notice 1400 (see Week 12). These depths should not hinder leisure craft. The illustration also covers the area affected by notice 55 and 797 of 2015 so the changes by this notice are shown in magenta ink and the changes by the other previous two notices in blue ink. 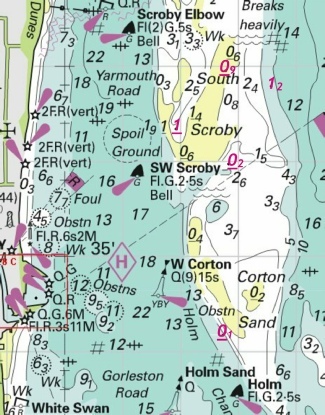 ENGLAND - East Coast - Approaches to the River Ore - Orford Haven - Buoy. 52° 02´·04N., 1° 28´·38E. to: 52° 01´·85N., 1° 28´·20E. Imray Chart: C1, C25, C28. ENGLAND - East Coast - Approaches to Great Yarmouth and Lowestoft - Depths. Drying heights. Surveys have shown that depths and drying heights less than charted exist in the approaches to Great Yarmouth and Lowestoft. These changes have been included in New Editions of Charts 1534 and 1535 published 2 April 2015. They will also be included in a New Edition of Chart 1543 to be published mid 2015 and a New Edition of Chart 106 to be published in late 2015. 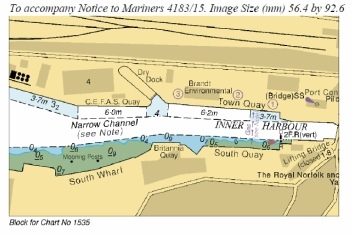 Mariners are advised to refer to the largest scale charts for the latest information. Imray Chart: C25 and C28. As can be seen, no specific details are provided in this preliminary notice. ENGLAND - East Coast - Sizewell Bank - Depth. depth, 4.2 , and extend 5m contour NE to enclose 52° 12´·75N., 1° 39´·53E. UKHO Admiralty Charts: 1504, 1543 and 1610. A reduction in depth indicating an extension of the Sizewell Bank to the north-east. ENGLAND - East Coast - The Would - The Would NW - Wrecks. Wk with Wk at 52° 58´·82N., 1° 28´·79E. UKHO Admiralty Charts: 106, 1408, 1503 and 1504. 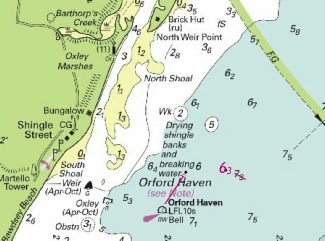 Depths now indicated on two wrecks on the Would (north of Sea Palling). The depths are such that these are unlikely to trouble leisure craft. ENGLAND - East Coast - Sizewell NE - Wreck. ENGLAND - East Coast - Newarp Banks SW and SE - Depths. depth, 10.6 at 52°44´·49N., 1°53´·26E. Delete depth, 12.3 , close S.
depth, 9.5 , enclosed by 10m contour 52°44´·21N., 1°50´·66E. depth, 13.4 , enclosed by 15m contour at 52°42´·72N., 2°02´·55E. Delete depth, 15.7, close S.
depth, 10.9 at 52°41´·34N., 1°58´·96E. Delete depth, 13.3, close SW.
depth, 12.4 , and extend 15m contour SE to enclose 52°40´·42N., 1°59´·81E. Delete depth, 13.8, close NW. UKHO Admiralty Charts: 106, 1504 and 1543. Five reductions of depth on the Newarp Banks. These depths should not hinder leisure craft. The illustration also covers the area affected by notice 55 and 797 of 2015 so the changes by this notice are shown in magenta ink and the changes by the other previous two notices in blue ink. legend, Navigation prohibited, centred on: 52° 04´·75N., 1° 32´·65E. Now here is something we do not see everyday, the removal of a navigational restriction! 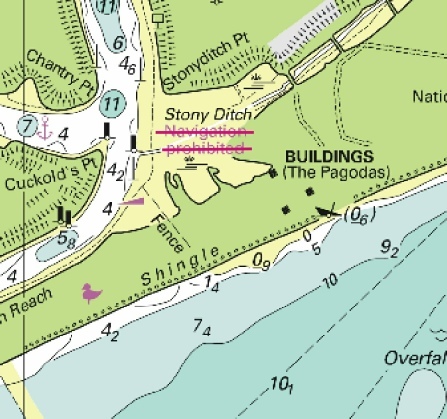 This is in Stoney Ditch on the River Ore.
ENGLAND - East Coast - North Cross Sand S, Middle Cross Sand, South Cross Sand and Corton Sand SE - Depths. depth, 8.9, enclosed by 10m contour at 52°42´·83N., 1°50´·60E. depth, 1, enclosed by 2m contour at 52°36´·35N., 1°50´·71E. depth, 1.5, enclosed by 2m contour at 52°34´·41N., 1°48´·84E. UKHO Admiralty Charts: 1534, 1535 and 1543. Further reduced depths on the various sands off Great Yarmouth indicating continued movement in these sands. There was an earlier notice of reducing depths earlier in the year vide NtM 55 of 2015. The depths indicated by this notices are shown in magenta as usual and the earlier changes under notice 55 are added in black. I hope this helps. depth, 86 , enclosed by 10m contour at 52° 43´·50N., 1° 50´·48E. depth, 56 , enclosed by 10m contour 52° 39´·77N., 1° 53´·41E. depth, 91 , enclosed by 10m contour 52° 35´·14N., 1° 49´·99E. depth, 08 , enclosed by 2m contour 52° 35´·00N., 1° 50´·14E. UKHO Admiralty Charts: 106, 1504, 1534 and 1543. 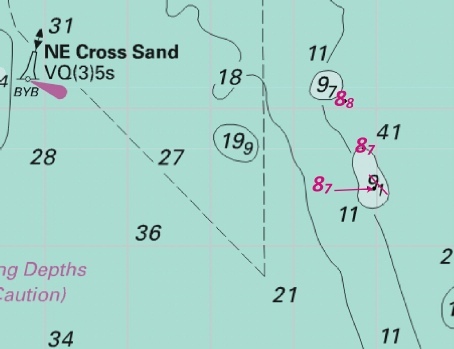 Reduced depths, some of them quite dramatic around the North, Middle and South Cross sands off Great Yarmouth. ENGLAND - East Coast - Haisborough Gat SW - Wreck. at 52° 48´·26N., 1° 49´·39E. New wreck found in the Haisborough Gat but the depth will not trouble leisure craft. ENGLAND - East Coast - Approaches to Great Yarmouth - South Cross Sand SE - Depth. depth, 183 , enclosed by 20m contour at 52° 33´·00N., 1° 57´·84E. A reduction of depth well offshore from Great Yarmouth and still a depth that will not cause leisure users any problem. SC5614 7th Edition - Orford Ness to Whitby. NORTH SEA - United Kingdom Sector - Horne & Wren Gas Fields - Works. Platform. - Buoyage. As part of the decommissioning of Horne & Wren Gas Fields, work is taking place to remove the Horne & Wren platform in position 52° 54´·19N., 2° 35´·83E. During the platform removal navigational aids on the platform may not be reliable. Underwater seabed obstructions may exist following the removal of the platform until clearance work is complete. North cardinal, Q at 52° 54´·50N., 2° 35´·91E. 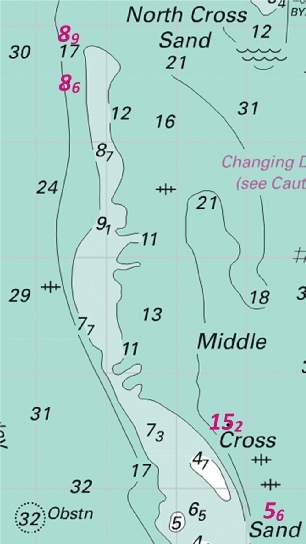 East cardinal, Q(3)10s at 52° 54´·23N., 2° 36´·36E. South cardinal, Q(6)+LFl.15s at 52° 53´·96N., 2° 35´·92E. 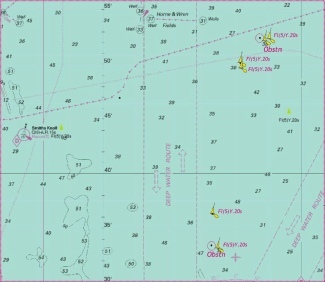 West cardinal, Q(9)15s at 52° 54´·23N., 2° 35´·47E. UKHO Admiralty Charts: 1408, 1503, 1504, 1631 and 2182A. NORTH SEA - United Kingdom Sector - Brown Ridge SW - Obstruction. UKHO Admiralty Charts: 1408, 1504 and 1631. Dangerous ordnance in the North Sea. Along way out and at 55 metres unlikely to trouble leisure craft! Government, Great Yarmouth Port Authority, ABP Lowestoft and Trinity House surveys. ENGLAND - East Coast - Approaches to Great Yarmouth - Caister Road SW - Depths. 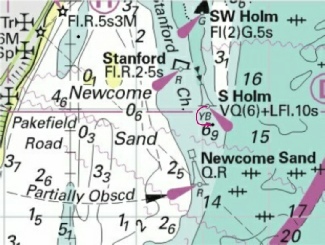 depth, 39 , and extend 5m contour NW to enclose (a) 52° 38´·28N., 1° 45´·06E. depth, 46 , enclosed by 5m contour (b) 52° 37´·91N., 1° 45´·01E. Two reductions of depth in Caister Road, Great Yarmouth. ENGLAND - East Coast - Approaches to Great Yarmouth - Caister Shoal - Depth. Insert depth, 07 , enclosed by 2m contour at 52° 40´·59N., 1° 45´·49E. 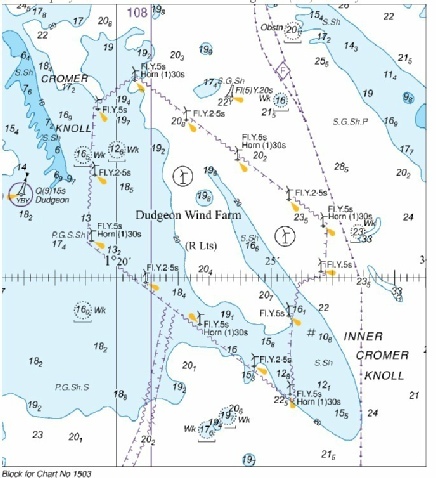 UKHO Admiralty Charts: 1534 and 1543. ENGLAND - East Coast - Blakeney Overfalls - Depths. depth, 1, enclosed by 2m contour at 53°02´·79N., 0°54´·83E. depth, 96 , and extend 10m contour E to enclose (a) 53°02´·69N., 1°02´·06E. depth, 97 , enclosed by 10m contour (b) at 53°01´·98N., 1°01´·34E. UKHO Admiralty Charts: 108, 1190 and 1503. Three reductions of depths at the Blakeney Overfalls. ENGLAND - East Coast - Great Yarmouth Outer Harbour - Lights. Amend light to, Q.G.17m3M at 52°34´·71N., 1°44´·74E. light to, Q.R.17m3M at 52°34´·60N., 1°44´·73E. UKHO Admiralty Charts: 1534, 1535. Change of height and range on the Great Yarmouth harbour lights. ENGLAND - East Coast - Approaches to Great Yarmouth - Drying heights. Depths. drying height, 0 9 , enclosed by 0m low water line 52° 36´·95N., 1° 46´·78E. depth, 12 , enclosed by 2m contour (a) 52° 36´·79N., 1° 48´·57E. drying height, 1 , and extend 0m low water line W to enclose 53° 36´·34N., 1° 46´·93E. drying height, 0 2 , enclosed by 0m low water line 52° 35´·97N., 1° 47´·84E. drying height, 0 1 , and extend 0m low water line SW to enclose (b) 52° 34´·17N., 1° 47´·74E. depth, 48 , enclosed by 5m contour (c) 52° 30´·99N., 1° 49´·01E. drying height, 0 5 , enclosed by 0m low water line 52° 30´·49N., 1° 47´·47E. Images courtesy of Imray Digital Charts and Meridien ID10. Note: This update is included in New Editions 1534 and 1535, published 10th July 2014. Imray Charts: C25, C28, C29. UKHO Leisure Folios: 5614.2, 5614.3, 5614.4. This is a partial correction of a notice in week 29. All the corrections are brought into one place here with these two images showing changes in depth off Great Yarmouth and Lowestoft. ENGLAND - East Coast - Approaches to Lowestoft - Lowestoft South Road N - Legend. 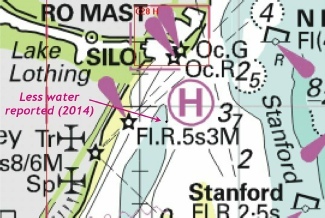 Insert legend, Less water reported (2014), centred on: 52°27´·90N., 1°45´·26E. Less water reported – no further details within Lowestoft South Road on the inside of the Newcome Sand. Notice 1807 - ENGLAND - East Coast - Great Yarmouth Outer Harbour - Depths. Insert depth, 57 at (a) 52° 34´·562N., 1° 44´·499E. This is a new reduced depth in the Outer Harbour so unlikely to trouble leisure craft. Notice 425 - ENGLAND - East Coast - Brown Ridge NW and W - Obstructions. Buoyage. (b) 52° 33´·4N., 2° 46´·4E. Fl(5)Y.20s (2 buoys) at 52° 36´·3N., 2° 46´·5E. at (a) 52° 52´·37N., 2° 53´·73E. This is a partial cancellation of Notice to Mariners 180 of 2013 (Week 2). The obstructions were at a depth that would be unlikely to trouble leisure craft and the buoys are now removed. Notice 173 - ENGLAND - East Coast - Southwold Eastwards - Foul. Insert # at 52° 19´·34N., 2° 02´·37E. This new foul is in over 30 metres of water and consequently is unlikely to trouble leisure craft. Notice 4859 - ENGLAND - East Coast - Southwold South-eastwards - Foul. Insert at 52° 15´50N., 1° 57´20E. Imray Charts: C25, C28 and C29. This is a new Foul 10.8nm ESE of the Southwold Harbour entrance in over 20m of water and therefore unlikely to hinder leisure craft. Image courtesy of Imray Charts and Meridian ID10. Left click to enlarge, right click to download. Notice 4089 - ENGLAND - East Coast - Lowestoft - Stanford Channel South-eastwards - Buoy. 52°27´·02N., 1°47´·08E. to: 52°26´·85N., 1°47´·15E. Imray charts: C25 and C28. Note that if you have the UKHO folio, this movement removes this mark from the bottom of chart 5614.3 but places it just on the top edge of 5614.1. Notice 3590 - ENGLAND - East Coast - Orford Ness - Lights. Radar beacon. Legend. Replace Fl.5s28m20M & F.WRG.14m17-12M, associated circular white arc and radar beacon, Racon (T), with LtHo (disused) at 52° 05´·0N., 1° 34´·4W. 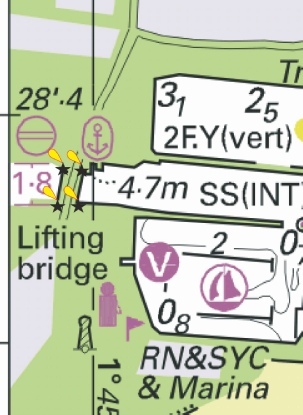 Delete Fl.20M Orford Ness and associated radar beacon, Racon(T) at 52° 05´·0N., 1° 34´·4W. Replace Fl.5s28m20M & F.WRG.13m17-12M and associated radar beacon, Racon (T) with Ñ at (a) 52° 05´·04N., 1° 34´·44W. Delete Orfordness at 52° 05´·0N., 1° 34´·4W. Notice 2945 - ENGLAND - East Coast - Lowestoft Harbour - East Jetty - Light. Amend light to, Fl.G.2·5s at 52°28´·36N., 1°45´·35E. Imray Charts: C28D and C28H. Change of light characteristics to the light on the end of the East Jetty at Lowestoft Harbour. 0000 UTC 1st August 2013. The previous edition of this chart should continue to be used until these changes are implemented. Notes: The chart numbers of the previous editions (dated 19th January 2012, 14th October, 2010, 18th October, 2012 [for both charts 1406 and 1408] and 17th February, 2005 respectively) is to be changed to X110, X122, X1406, X1408 and X1504. They will be updated independently and withdrawn shortly after the implementation date. Copies of the previous charts can be obtained, until 1st August 2013, by ordering X110, X122, X1406, X1408 and X1504. West Inner” and “TSS Maas West Outer”. 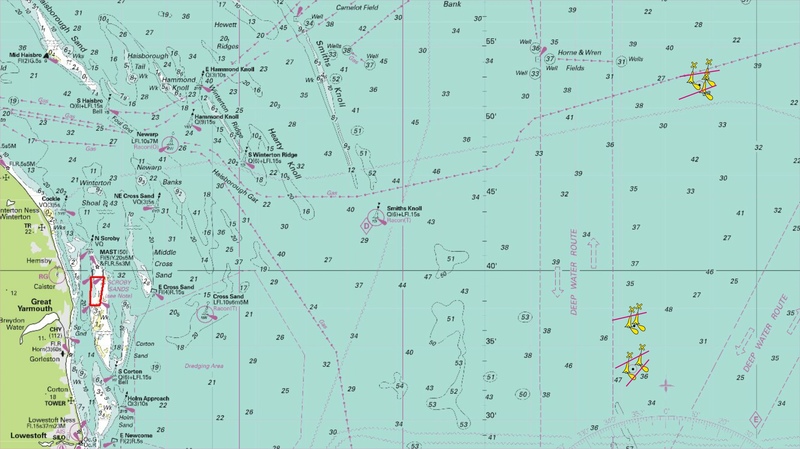 Also includes changes to precautionary areas, extension to deep water channel, changes to Areas to be Avoided, anchorages, buoyage and depths from the latest Netherlands surveys. Northwest”, “TSS North Hinder North”, “TSS Maas West Inner”, “TSS Maas West Outer”, “TSS Ijmuiden West Outer”, TSS Ijmuiden West Inner” & “TSS Off Texel”. Also includes changes to precautionary areas, extension to deep water channel, changes to Areas to be Avoided, anchorages, buoyage and depths from the latest Netherlands surveys. 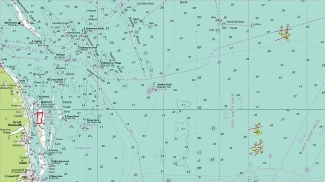 Includes changes to the IMO-adopted Traffic Separation Scheme 'TSS North Hinder North' and new IMO-adopted precautionary area 'West of Rijnveld'. 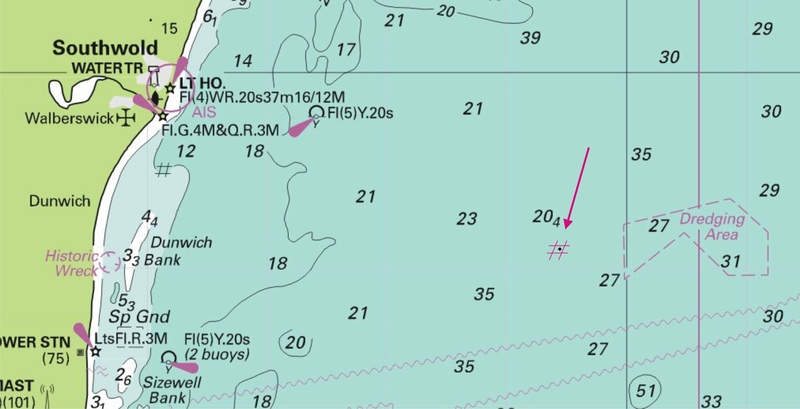 Also includes changes to precautionary areas, buoyage, Areas to be Avoided and depths from the latest Netherlands surveys. 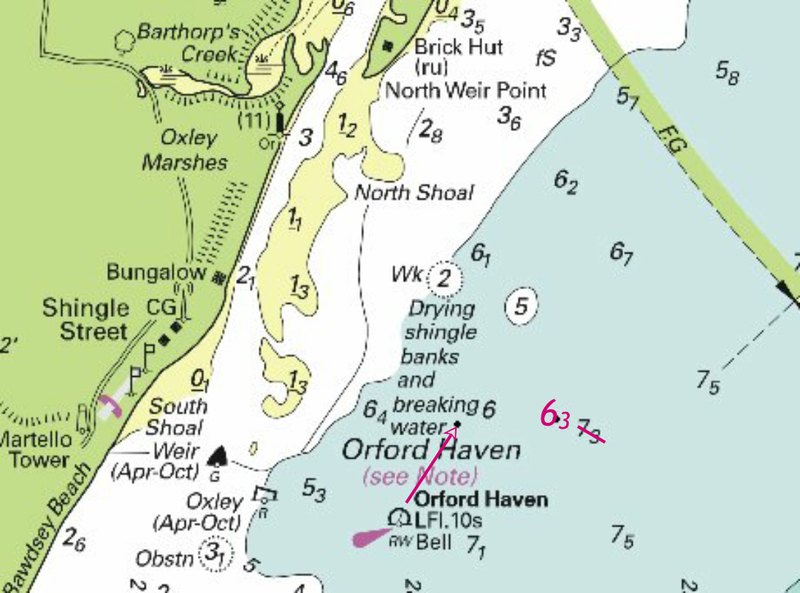 Notices to Mariners affecting source charts. Notice 2408 - ENGLAND - East Coast - Felixstowe - Orford Haven South-eastwards - Depths. Insert depth 63 enclosed by 7m contour at (a) 52° 01´·86N., 1° 28´·57E. Imray charts: C1, C25 and C28. 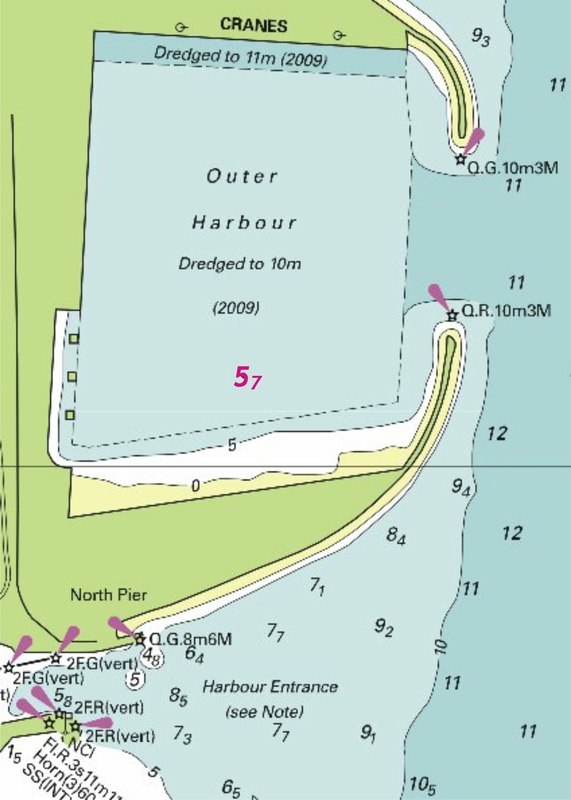 Slightly reduced depth to the east of the current position of the Orford Haven SWM. Illustration indicates current position of the SWM as well as this amendment. Notice 597 - ENGLAND - East Coast - Southwold - Light. Automatic Identification System. Note: This update will be included in a New Edition of Chart 1543 to be published 7 March 2013. Insert the accompanying block, showing amendments to light, centred on: 52° 16´·70N., 1° 41´·70E. 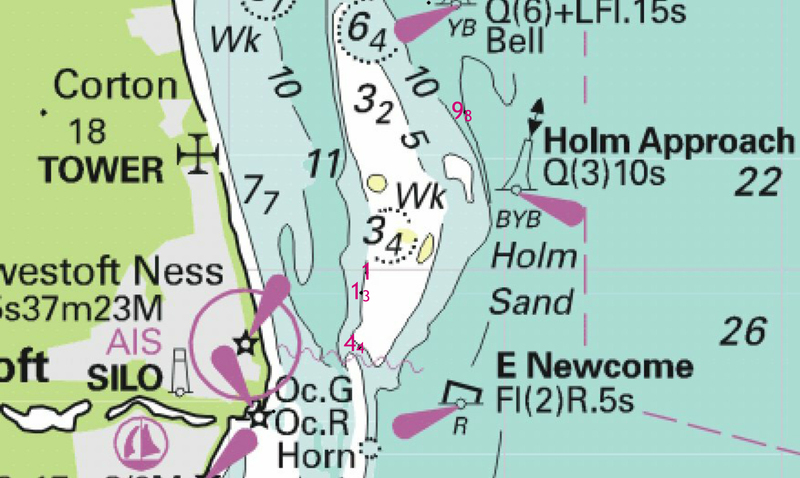 Fl.24M Southwold at (a) 52° 19´·6N., 1° 40´·9E. Image courtesy of Imray/Meridian ID10. Left click to enlarge, right click to download. Block is copyright of the UKHO. Left click to enlarge, right click to download. Notice 493 - ENGLAND - East Coast - Lowestoft and Approaches - Depths. Insert depth 98 enclosed by 10m contour at 52° 31´·74N., 1° 49´·29E. Insert depth 45 at (a) 52° 28´427N., 1° 45´822E. Insert depth 44 enclosed by 5m contour at 52° 29´·14N., 1° 47´·36E. depth 13 enclosed by 2m contour at 52° 29´·74N., 1° 47´·42E. depth 1 enclosed by 2m contour at (a) 52° 29´·96N., 1° 47´·52E. Insert depth 44 and extend 5m contour SW to enclose 52° 29´·14N., 1° 47´·36E. depth 13 enclosed by 2m contour 52° 29´·74N., 1° 47´·42E. depth 1 enclosed by 2m contour 52° 29´·96N., 1° 47´·52E. depth 98 and extend 10m contour NE to enclose 52° 31´·74N., 1° 49´·29E. 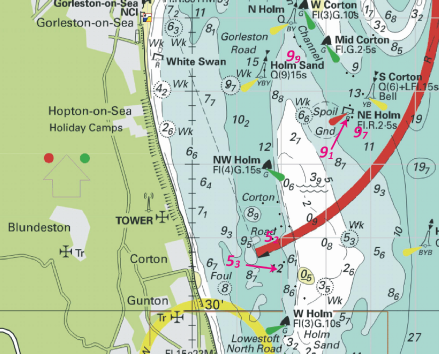 5 corrections to depths – 4 around the Holm Sand (and worth noting) and one on the approach to Lowestoft. Notice 180 - ENGLAND - East Coast - Brown Ridge North-westwards, Westwards and South-westwards, Welland Gas Field North-eastwards, Outer Dowsing Shoal North-westwards and Lowestoft - Obstructions. Buoyage. 1. Obstn at (a) 52° 52´·4N., 2° 53´·7E. and (b) 52° 33´·4N., 2° 46´·4E. 2. Fl(5)Y.20s (2 buoys) at 52° 50´·1N., 2° 50´·7E. and 52° 36´·3N., 2° 46´·5E. 3. Fl(5)Y.20s (3 buoys) at 52° 18´·6N., 2° 27´·6E. Delete Fl.Y.10s at 53° 03´·3N., 2° 48´·3E. 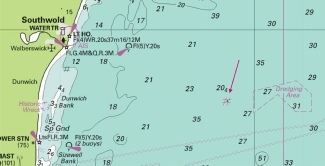 Delete Automatic Identification System, AIS, at light 52° 29´·22N., 1° 45´·34E. 1. 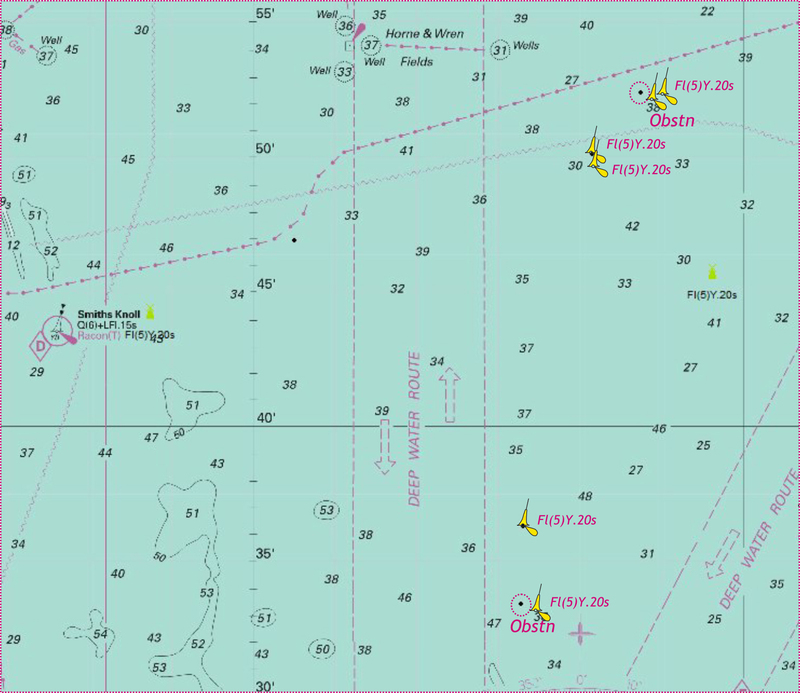 Obstn at (a) 52° 52´·39N., 2° 53´·73E. 2. Fl(5)Y.20s (2 buoys) at 52° 50´·14N., 2° 50´·74E. Delete Fl.Y.10s at 53° 03´·12N., 2° 48´·28E. Insert Fl(5)Y.20s (3 buoys) at 52° 18´·62N., 2° 27´·56E. Two seabed obstructions in this gas field area but at a depth that will not trouble leisure users. Some additional yellow special marks also included in the notice. The yellow buoy deleted is just out of image (to the north), being the removal on one of the many yellow buoys near the Thames Field. This one was due east of the Thames Field West Cardinal buoy. 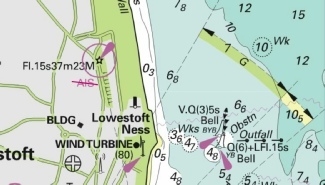 The AIS deletion is the light at Lowestoft Ness.